No dishes needed for this fun and healthy treat, bursting with antioxidants. Take this snack on the go, to a soccer game, or on a hike. This kid friendly recipe is fun to make as a team and even better to eat. * If you would like lower fat, substitute low-fat or nonfat dressing, and change nutritional counts accordingly. Cut the pepper in half (from side to side). Clean out the seeds from the inside and wash well. Now you have two pieces. One will be your pepper-shaped bowl. Cut the other half of the pepper into skinny slices. Cut the carrot into skinny sticks about 4″ long. Cut celery into skinny sticks so each one is about 4″ long. Add the snow peas. Put a little salad dressing in the bottom of your pepper-shaped bowl. Put the sticks, carrot sticks, and pepper slices into the pepper bowl. Now it’s portable! 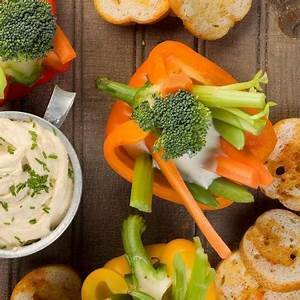 You can eat the veggies with a little dressing. Then when you’re finished with the veggies, you are ready to eat the bowl!